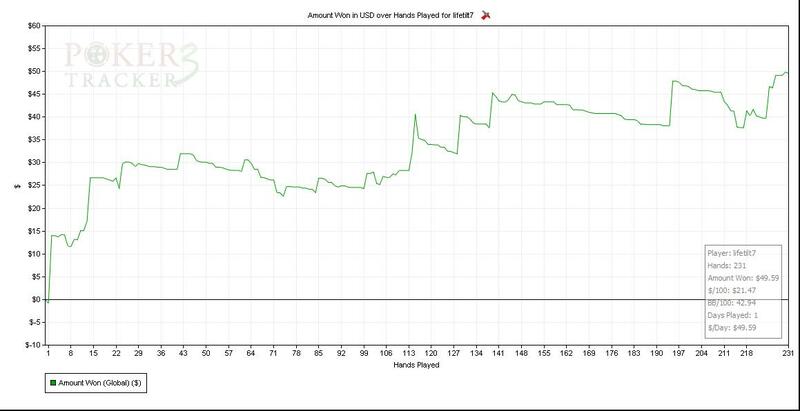 I took most of the start of this month off of cash games and studied up a good bit and changed up my game a bit. So far it has been more than successful and I hope it continues to go well for me. I haven’t quite been able to put in the volume I want, up until tonight, but I hope to change that soon. So far this month, I’ve been running at 4.5BB/100 hands, but I don’t expect to be able to hold that winrate. I feel I will be able to hold between 2 and 2.5BB/100 hands in the longterm at 50NL rush. On Sunday I decided to play some mtts on Absolute, and Full Tilt. I ended up only cashing in one mtt out of both sites and that was for $19 and change. I believe I ended down about $350 on the day. Now that it’s a new month I’ve decided to get back on the grind of cash games instead of tournaments. Today I played for about 4.5 hours, 6 tabling .25/.50NL 6max on RPM, and 2 tabling .25/.50NL 6 max rush on Full tilt. The day started off great on both sites, then got a little shaky but still ended up being a really good day. After my recent scores on Absolute, I decided to cash out $1,000. I was looking around and found a 100% first time deposit bonus up to $500 for a site called RPM poker, on the Merge network. I decided to deposit the full $500 to try and take advantage of the full bonus. I have until March 31 to clear the bonus. I don’t think I will be able to clear all $500, but luckily it is released in $10 increments. I need to clear 37,500 VIP points to unlock the full bonus. On their site, for every $1 you pay in rake, you earn 10 VIP points. After crunching some numbers, I will need to pay $3,750 in rake to earn the full bonus. With the small traffic on the site, I’m hoping to clear at least $300 of the bonus, which means earning 22,500 points(paying $2,250 in rake). As long as I can at least break even playing over the next two months or so, paying that in rake, will earn me an additional $787.50 in rakeback, so I would make almost $1,100 on top of any profit or loss in that time. Overall so far, I find the Merge network to be pretty soft. I probably would have shown a profit for sngs tonight but lost with KK to AK twice, once on the bubble. Hopefully I continue to run decent on this site on my quest to clear the $500 bonus.